Orthotics are often prescribed by doctors to correct improper foot alignments, prevent foot problems or relieve pain from existing foot ailments. However, they do more than that. Controlling the feet controls the rotation of your leg, which in turn can also affect and help your ankle, leg, knee, hip and even relieve back pain. Take an interest in the health of your body before it’s too late and find out if you need custom made orthotics. Custom orthotics are specially made shoe inserts. They are made in many different ways and consist of many different materials. They help to give your feet the optimal functionality resulting in your best performance. They do this by enhancing your gait and posture which will allow natural healing of pain. Orthotics should make standing, walking, running, or any other physical activity more comfortable for your feet. It can also minimize the stress and strain exerted on your bones, joints, ligaments and tendons. At ArchMasters–Orthotics Shoes & Footcare, llc., we can provide you with custom made orthotics. Remember, even when they are made from the same materials, no two orthotics are alike! 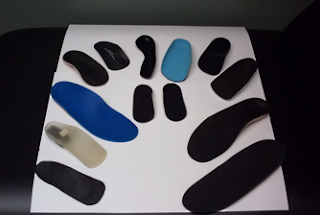 Our orthotics are available in many different shapes, sizes, and materials depending on your personal circumstances. At our facility we offer a wide variety of orthotics specifically intended for different sports, activities and personal circumstances. Multiple prefabricated to custom made orthotics are available for you. If you are unsure of the orthotic that is best for you, have no worries. Speak with one of our trained staff members or schedule a free consultation with Dr.David Sables. Our staff and owners will be sure to help you discover the ideal orthotic for your need to get you back to work and play – fast. Many times, the custom molded prescription pairs are available in as little as two days! If you wish to obtain orthotics or require additional information on how orthotics can help the health of your feet, contact ArchMasters–Orthotics, Shoes & Footcare, llc. at (615) 370-3000 and ask to speak with owner and podiatrist, Dr. David Sables or licensed certified pedorthist, Linda Sables. Shoes that Work for You!